Memphis Aldean continues to steal hearts across the nation with his adorable antics. This time, he showed off some pretty sweet moves to dad’s big hit. To giving his mom the best birthday present ever – his first steps! Memphis has definitely brightened his parent’s lives and continues to be one of the most talked about babies in the United States! But with Jason Aldean as his father, could we expect any different? His song “You Make It Easy” talks about how it is easy to love when you’re with the perfect person. It hit #1 in the U.S. and Canada on the Billboard country charts. So when little Memphis heard daddy’s hit song come on the radio – he just started to dance and there was no stopping him! Only a few months after learning to walk, and this guy is on the move. 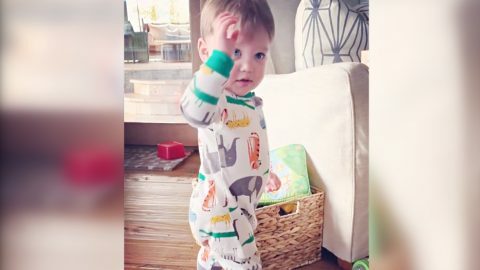 Wearing his safari printed pajamas – he shows off his moves in the adorable video below. And while Memphis is a bundle of joy on his own – the Aldean family continues growing as they await baby #2. With the expanding family, the Aldeans have also decided to expand their home and literally build it from the ground up. Baby Memphis has a lot to look forward to in the next year – maybe that is why he is so excited to dance and celebrate! The family did a fun, baseball-inspired gender reveal in August and you could just feel the energy coming from all the kids. Watch it in the video below and let us know what you think in the comments!